Sacred Objects, Places, and People (Part 1 of 3) . . . In this three part series, we will be looking at how people, and more specifically Asians, use sacred objects, sacred places, and sacred people to maintain social harmony between the secular world in which one presently resides and the sacred world. In essence, we will see how such cultural phenomenon replicate an Old Testament form of worship and basically serve as mediators to receive blessings in this life. The use of apotropaic objects is a common occurrence among the peoples of Asia. The word apotropaic means “warding off evil.” Apotropaic objects come in many different forms: a few include candles, roots and herbs, oils, curios, symbols, amulets, trees, stones. They are used to avert dangerous situations in order to enhance luckiness in this world. People use such objects for protection, to maintain social harmony between the secular and sacred world, and/or to serve as mediators to receive a blessing. The Ryukyu Islands are located to the southwest of Japan and form a culturally important bridge between Japan and Taiwan. The Islands consist of two prefectures, Kagoshima and Okinawa and comprise over one hundred small subtropical islands. Of these, over fifty islands are inhabited, while the rest are mainly uninhabited coral reef. While traveling to the various inhabited Ryukyuan Islands, one will discover people using many different forms of apotropaic objects. 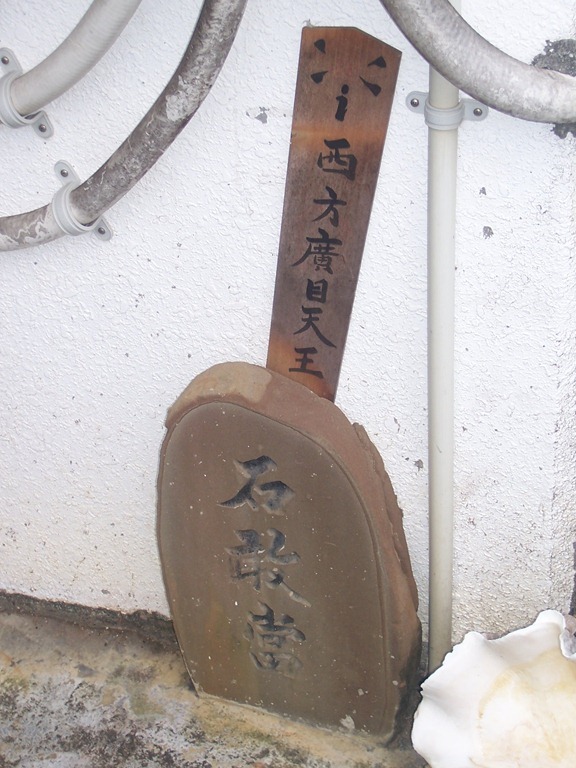 On and near Okinawa, one will notice objects known as ishiganto. Often placed strategically at the corner of intersections, ishiganto (seen to the right) maintain social harmony between the secular and sacred world. In practical terms, they deflect misfortune from happening at intersections in the form of car accidents. When a car accident does occur at an intersection, then social disharmony has taken place resulting in the secular world and sacred world coming out of balance with one another. 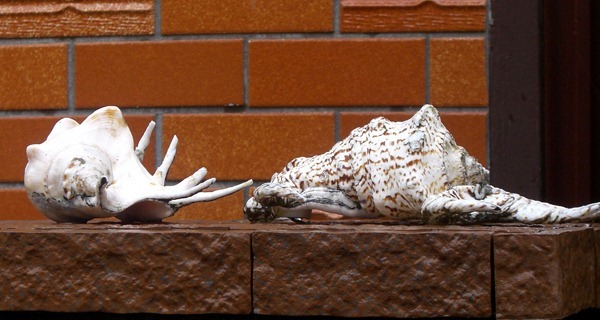 On the island of Amami-oshima, the people place conch shells on the outer walls surrounding their homes. Cultural informants say that only on e in a hundred conch shells have seven fingers and the people use these special seven finger conch shells to ward off evil (seen to the left). Some cultural informants say that the fingers represent the bulls horn. Other informants say people on the island do not hang them on the gate but simply display them in the entry way to the house. In one situation, an elderly man had one inside his home on a bookshelf. Another interpretation by cultural informants concerning the meaning of the seven fingers is that it prevents fire since the shape of the horn is similar to the Chinese character for water (水). 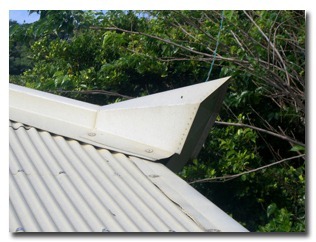 On the island of Tokonoshima, the roofs of the people’s homes are built with a horned shaped design (seen to the right). Informants say that they use such a design because it represents the dragon’s horn and thus will ward off evil, bringing luckiness or a blessing in the home. In this situation, one can see how patterns in architecture might be a clue as to how the people view apotropaic objects. 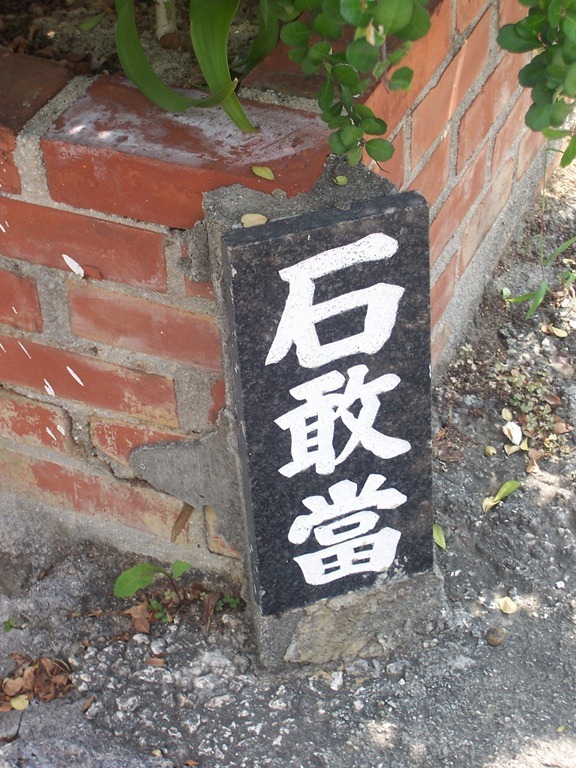 On the island of Okino-erabu, the people place special markers (seen to the left) at the entrance to their homes, just before entering their door or on both sides of the entrance gate. These objects, as seen in the previous examples, also serve as forms of mediators between the secular and sacred world, allowing the people to avert misfortune, maintain social harmony, and to allow some form of blessing to enter their home. Apotropaic objects, as illustrated in the few examples above, call upon guardian spirits, ancestors, or angels; and refuse entrance to evil spirits or negative energies. As already mentioned, such objects bring protection and often are accompanied with spells and/or charms. Sacred objects are a common everyday part of life in Asia. They serve as mediators between this world and the other-world, a sacred world. Previous PostScratching their Back . . .Next PostSacred Objects, Places, and People (Part 2 of 3) . . .